To John Salamone, professor of psychology and longtime researcher of the brain chemical dopamine, scientific research can be very slow-moving. 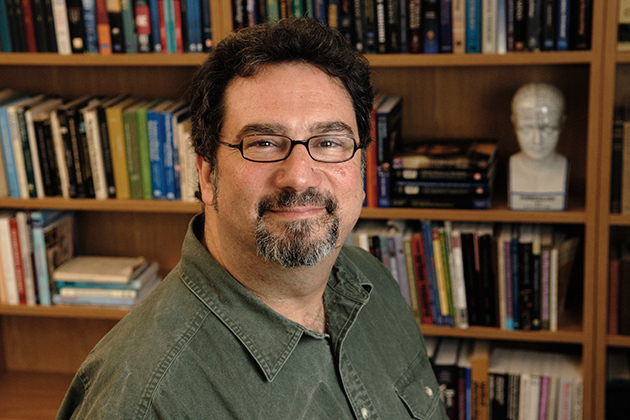 Salamone, a UConn Board of Trustees Distinguished Professor, has spent most of his career battling a particular long-held scientific idea: the popular notion that high levels of brain dopamine are related to experiences of pleasure. As increasing numbers of studies show, he says, the famous neurotransmitter is not responsible for pleasure, but has to do with motivation. He summarizes and comments on the evidence for this shift in thinking in a Nov. 8 review in the Cell Press journal Neuron. In the early 1980’s, explains Salamone, the National Institute on Drug Abuse put out a call for research on the neurological basis for drug abuse and addiction. The research that ensued built support for the idea that when the brain produced elevated amounts of dopamine, it was accompanied by perceptions of pleasure. The chemical quickly became known for this relationship, which was thought to be important for responding to drugs and other motivational substances, such as food. The chemical, which was formerly only thought to play a small role in movement, became over the subsequent decades among the most well-known and important in the brain. It turned out to be so important that it found its way into popular culture, with dozens of self-help books and websites explaining its relationship to feelings of happiness and reward. But over time, Salamone’s studies and those of others started revealing problems. In animals, dopamine levels can spike after stress, such as losing a fight with another animal. Soldiers dealing with post-traumatic stress disorder also show activity in dopamine-rich parts of the brain when hearing recorded gunshots and other combat sounds. Low levels of dopamine make people and other animals less likely to work for things, so it has more to do with motivation and cost/benefit analyses than pleasure itself. So if dopamine was really the pleasure element, then why all this association with negative experiences? “Low levels of dopamine make people and other animals less likely to work for things, so it has more to do with motivation and cost/benefit analyses than pleasure itself,” he explains. In essence, says Salamone, this is how amphetamines work, which increase dopamine levels and help people motivate to focus on tasks at hand. The big implications of this change in understanding come at the level of overlapping motivational symptoms of depression with those seen in other disorders such as schizophrenia, multiple sclerosis, and Parkinson’s disease. Symptoms of fatigue may be related to low levels of dopamine or changes in other parts of the same brain circuitry. On the one hand, this lack of perceived energy is maladaptive, because it reduces the tendency to interact with the environment. But, Salamone says, it could also reflect the body’s attempt to save energy in a crisis. He points out that new ideas in science are traditionally met with criticism. But after all the mounting evidence, he says he’s no longer regarded as “a crazy rebel,” but simply someone who thought differently. Although he has thought about writing a popular-press book, he’s not sure he really wants to go to the public and “debunk” the dopamine hypothesis of pleasure and reward. But if he ever does, one thing is for sure. Salamone’s work has been funded by the National Institute of Mental Health, a division of the National Institutes of Health, and by the National Institute on Drug Abuse. His co-author is Mercè Correa of the Universitat Jaume I in Spain.